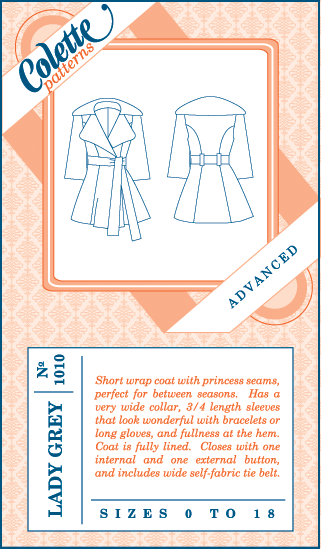 Gertie's New Blog for Better Sewing: Get 20% Off the Lady Grey Pattern! Get 20% Off the Lady Grey Pattern! Great news, readers! Sarai of Colette Patterns is offering us 20% off the Lady Grey coat pattern that we'll be using for our sew-along (blogged this morning.) To take advantage, just enter the code GERTIE20 (note that it's case sensitive) at checkout. Many thanks to Sarai for offering this generous discount! Update: the code will expire on September 30th, 2010. Thanks Gertie! This pushed me over the edge (past my fear?). Just ordered the pattern. Seems I'm likely in. Thank you, all! I just ordered mine and am very excited. I'm pretty short and would like to make the collar smaller. Would you (or someone else) be able to offer guidance on that? YAY! I lurk here every day, and even though I've never officially joined a sew-along before, I just can't pass this one by! You sure know how to make a girl want to join a sew-along. I'm in! Nothing like twisting my arm Gertie and many thanks to Sarai for the discount! I'll be slow going but I'll be going. Thanks, Gertie and Sarai! I just ordered my pattern and can't wait to start! Thanks to both of you! I guess I'm in! Thanks so much! I just placed my order. After seeing Tasia's finished Lady Grey on sewaholic.net I've been dying to try it. Now there is no excuse! Thanks ladies! Ok, I'm in - I have coat fear, but I'll give it a try! Okay, I'm in! Just ordered my pattern. I'll be making this for my daughter. With a cute lining, this coat is just her style. Thanks, Gertie and Sarai! I just ordered my pattern. Yeah! You guys are all so very welcome! I can't wait to see what you all come up with. This is extremely exciting! I've ordered my pattern! Thank you Gerti & Sarai!! I'm so excited about this. Any suggestions on a good place to order the fabric on line? I've been eying up this pattern for ages, and between the sew along and this discount, I think I'm going to try this out. I've never done a sew along before! :) Thank you for organizing this. That is so awsome. I am buying my pattern today. I am really looking forward to learning lots of stuff from you guys and getting a pretty coat to boot! Thank you, Sarai and Gertie. It is much appreciated. I, too, have been visiting here every morning with my coffee in hand. I'm just so inspired and looking forward to this. Thankyou! Thankyou! Oh, I want to play! Oh my. I'll probably have to participate, too! Sarai is clever, no doubt of it. How many people who probably would not buy this pattern are going to buy it now? I'd just admire it from afar, but now I feel compelled to really have it! Your red coat was the reason for my purchasing the Lady Grey pattern (and yummy purple wool coating with green silk lining!) a couple of weeks ago, so your sew along has come at the perfect time! May I say, I have only recently discovered your blog, I am enjoying catching up on the archived posts. They are a rich and varied source of inspiration. Thank you. You should be really proud of what you have achieved through this forum. I second the request for recommendations on fabrics as well as where we can get a good deal online. I'm new to the online fabric shopping market (and unfortunately all we have around here is JoAnn's) so any help is appreciated! I'd love to make a white coat just like the modeled version! Also, apart from the actual fabric for the project, I'm assuming I'll need a muslin? What type of fabric do you recommend for that? How wonderful. Just ordered the pattern. I have a question and am hoping someone can help me. I have ordered my pattern but now I'm trying to find fabric. I'm normally really conservative but I want this coat to be really fun so I was thinking of making it in black hi low corduroy (for the conservative part of me) with a bright Pink/fuchsia silk linking (for fun, I LOVE pinks). Anyone have suggestions of a good place to purchase this fabric? This is my first ever sew along! i ordered my pattern just now thanks to a link on your Facebook page! Not many places in the UK have this one. Cant wait to start! I've ordered a copy. Looking forward to this! My first sew-along and commercial pattern! Yay, thanks for the discount. Going to order my pattern now. Still on the fence about fabric ... twill is more to my budget, but wool would be more useful, as I'm thinking a maroon or red color so I can wear this to my son's marching band activities (their colors are red and black, and I have a black wool coat). This may end up being my Christmas present, lol. Just bought my pattern this weekend. I also pulled my mom into this pattern sewalong! So excited that I cam across this blog!! I'm in, I'm in! !